Last week kicked off five straight weeks of Camp Darfur on campuses and in communities from CA to Minnesota and all the way to Hawaii! Three years ago, hosting Camp Darfur was how I got hooked into the SGN community. It was at an event I helped organize back in Portland, OR with the Unitarians and the Portland Coalition for Genocide Awareness. We aren’t as busy as we used to be with the Camp when I first started in September 2007, and we ship it the long distances we used to be able to travel, but it’s still a core part of educating and raising awareness about genocide. This past week the camp was hosted by an Armenian Sorority, Alpha Gamma Alpha, at the University of California San Diego. They partnered with the Jewish Fraternity, Alpha Epsilon Pi, and the Cambodian Student Association to educate their campus for an entire week. Tomorrow, April 24th, is the 95th anniversary of the Armenian Genocide. Yom HaShoah, Holocuast Remembrance Day was Sunday, April 11th, and other commemoration and remembrance days span the month of April which is becoming known as Genocide Prevention Month. With all the programs and initiatives that SGN and i-ACT contribute to, sometimes Camp Darfur can be time consuming. Working with the UCSD group of students re-inspired and energized me for the next three weeks of travel with the Camp. They reminded me of the importance of having groups host the Camp, and make it their own to educate their peers. 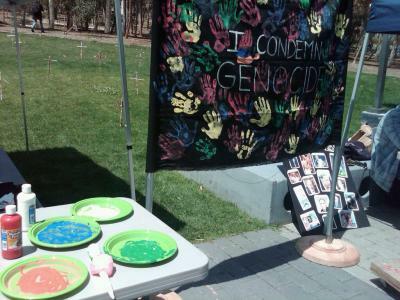 Without students, like those at UCSD there would be no hope for humanity to end genocide. But as long as they are working, I am here to support them. Thank you Nare and her Sisters!